The Dark Crystal is a 1982 British fantasy film that tells the story of Jen, an elflike "Gelfling" on a quest to restore balance to his alien world by returning a lost shard to a powerful but broken gem. Directed by Jim Henson and Frank Oz, creators of The Muppet Show. Written by David Odell and produced by Gary Kurtz. For this is the way of the Skeksis. As they ravaged the land, so too they learned to draw new life from the sun. Today, once more, they will replenish themselves, cheat death again, through the power of their source, their treasure, their fate - the Dark Crystal. Another world, another time, in the age of wonder. A thousand years ago, this land was green and good - until the Crystal cracked. For a single piece was lost; a shard of the Crystal. Then strife began, and two new races appeared: the cruel Skeksis, the gentle Mystics. Here in the castle of the Crystal, the Skeksis took control. Now the Skeksis gather in the sacred chamber, where the Crystal hangs above a shaft of air and fire. The Skeksis with their hard and twisted bodies, their harsh and twisted wills. For a thousand years they have ruled, yet now there are only ten. A dying race, ruled by a dying emperor, imprisoned within themselves in a dying land. Today, once more, they gather at the Crystal as the first sun climbs to its peak. For this is the way of the Skeksis. As they ravaged the land, so too they learned to draw new life from the sun. Today, once more, they will replenish themselves, cheat death again, through the power of their source, their treasure, their fate - the Dark Crystal. But today, the ceremony of the sun gives no comfort. Today, an emperor lies dying. Today, a new emperor must seize the throne. A thousand years ago, the Crystal cracked. And here, far from the castle, the race of Mystics came to live in a dream of peace. Their ways were the gentle ways of natural wizards. Yet now there are only ten. A dying race, numbly rehearsing the ancient ways in a blur of forgetfulness. But today, the ritual gives no comfort. Today, the wisest of the Mystics lies dying. Today, they summon the one who must save them. In the valley of the Mystics, there lives a Gelfling, Jen. The Skeksis killed his family, destroyed his clan. Only Jen survived, to be raised by the wisest of the Mystics. But there is a prophecy. A thousand years have passed, and now, once more, the world must undergo a time of testing. Now it must he healed, or pass forever into the rule of evil. At this time, Jen is the chosen one. Today, Jen's pipe gives no comfort. For today, his master lies dying. And a journey must begin - the journey of Jen. What in the world? This place is weird. Let's see. Her name is Aughra. "Follow the Greater Sun for a day to the home of Aughra." Hmph. Some directions! Who is Aughra, anyway? One of these things? Maybe she murders Gelflings. What am I doing here? By Gelfing hand or else by none. But Gelfling all dead! Garthim kill them all! You can't be Gelfling! You look like Gelfing... smell like Gelfing... maybe you are Gelfing! A thousand years ago, there was a Great Conjunction. I was there. Three suns lined up. That's when the Crystal cracked. That's when the Skeksis appeared, and the Mystics. Another Great Conjunction coming up! Anything could happen. Whole world might burn up. [snorts] End of Aughra! Hm! The Great Conjunction is the end of the world! Or the beginning. Hm! End, begin, all the same. Big change. Sometimes good, sometimes bad. Stupid Garthim! You want Gelfling? Why not ask me?! No - easier to send your crab-brained soldiers, burn my home! Now home gone, Gelfling gone - nothing but Aughra! Mouldy mildew, mother of mouthmuck, dangle and strangle and death! UrZah: [at urSu's funeral] Dear friend, be well. Receive your belongings, receive them serenely. Now we send forth Jen. Watch over his dangerous quest. SkekZok: Crystal bats, fly! Search the land! Search the water! Search the sky! We may meet in another life... but not again in this one. UrSu: You are in danger, Gelfling... and I must leave you. Jen: Leave me? Master, no! UrSu: Gelfling, I have told you of the Skeksis. 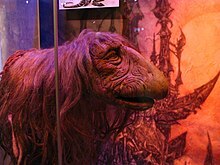 Jen: The Skeksis killed my mother and father. UrSu: The story runs deeper than you know, and you are part of it. 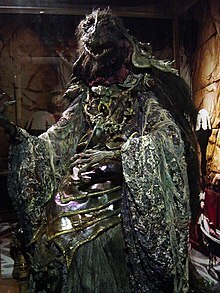 UrSu: The Skeksis will vow to destroy you... for the prophecy says you must find the shard. The Crystal shard. UrSu: To save our world, Gelfling, you must find the shard... before the three suns meet. If not, Skeksis rule forever. UrSu: Aughra holds the shard. Follow the greater sun for a day to the home of Aughra... there. She knows all the secrets. Jen: Aughra? Follow the greater sun? But master, I'm only a Gelfling. UrSu: I should've told you these things long ago. Now it is up to you. Remember me, Jen. We may meet in another life... but not again in this one. SkekEkt: Oh yes, my lord Chamberlain, time to choose an Emperor. SkekSil: Yes, it should be me! SkekUng: Not him, I must rule! SkekShod: [to skekZok] You could be the Emperor. SkekEkt: There's going to be a fight! Jen: I'm looking for Aughra. Jen: My master, wisest of the Mystics. Aughra: Where is he? Around here? Jen: You... Gelfing? Like me? Jen: But, I thought I was the only one. SkekZok: Watch your tongue, harridan! We are lords of the Crystal! Aughra: Lords? Not for long! What about the prophecy, that a Gelfling will end Skeksis power? He'll come! Make you crawl, like the worms you are! Jen: [while riding the Landstriders] The prophecy didn't say anything about this! Jen: Wings? I don’t have wings. Kira: Of course not. You’re a boy! UngIm: Now the prophecy is fulfilled. We are again one. Many ages ago, in our arrogance and delusion, we shattered the pure Crystal and our world split apart. Your courage and sacrifice have made us whole, and restored the true power of the Crystal. UngIm: Hold her to you. She is part of you, as we all are part of each other. UngIm: Now we leave you the Crystal of Truth. Make your world in its light. UrSu: I was born under a shattered sky. The Crystal sang to the Three made One. Jen: Master, please, it's me, Jen. UrSu: The rule of the Skeksis has brought pain, and evil Garthim serve the Dark Crystal. Jen: The Dark Crystal? What is that? UrSu: On High Hill, watching the heavens, sits the Dome of Aughra, keeper of secrets. A wanderer may come from under the mountain bringing murder and birth. UrSu: Mark well this crystal Shard. A Gelfling must restore it to its rightful place and heal the wound of the Dark Crystal. You are that Gelfling wanderer. UrSu: And this the tool to forge your fate. And now Gelfling... you are alone. Jen: Alone? But you're still with me. UrSu: Your journey must begin for the Three Suns will not wait. Remember me, Gelfling. We may meet in another life, but not again in this one. SkekSil: [asserting his right to the throne] Hitoi har ti! Aughra: Crystals, planets, suns, come together soon. Watch out! Boom! Big one coming up. Better be underground for that one. Whole world might burn up. End of Aughra! So what? We all turn into smoke in the end. Come from smoke too, some say. Who knows? Might not be so bad, smoke. Float around in the air, see world. Aughra: Look up, see what comes. See three suns become one. Last time, everything split apart. Boom! Aughra: Stupid Garthim! Gelfling was in my home. You burned my home! Now home gone, Gelfling gone - Porroh klet!! Burn, ruin, conflagration! SkekUng: Find that Gelfling now! SkekZok: [summoning the Crystal Bats] Kelflinkh Krakwhee! Aughra: "What was sundered and undone shall be whole, the two made one." The wound of the world is closed. How cool was that freaking movie? I would watch that any day over all of the digitized junk that I see now. Remember The Dark Crystal? How cool was that freaking movie? I would watch that any day over all of the digitized junk that I see now. Sure, [digital effects are] beautiful, but the [old-school effects] are so visceral and so real — the actual puppets and models, and actors interacting with monsters that they could see instead of a green screen. Kari Byron, as quoted in "Kari Byron: Mythbusters", Suicidegirls (Mar 30, 2011). The Dark Crystal is a difficult film to categorize, evaluate, and appreciate. For every positive thing one can say about it, a corresponding negative can be cited: It is a brilliantly conceived world... inhabited by less than compelling central characters; it is a marvel of technological achievement... all but undone by the limitations of technology; it is a very adult fantasy... that works best for undemanding adolescents; and, finally, it is a triumph of the puppeteer's art... which cannot escape its Muppet origins. Kenneth von Gunden (1989), Flights of Fancy: The Great Fantasy Films, p. 30. From the very first in scoring the music for The Dark Crystal, I set out to find two melodic ideas — one for the Mystics, the other for the Skeksis. These two motifs, when counterpointed, fuse to become one, and in the Great Conjunction at the film’s climax, they join to become the central theme. Trevor Jones, as quoted in Jim Henson's Red Book, Henson.com (January 14, 2013). What Jim wanted to do, and it was totally his vision, was to get back to the darkness of the original Grimm’s fairy tales. He thought it was fine to scare children. He didn’t think it was healthy for children to always feel safe. Frank Oz, as quoted in Q&A: Frank Oz on Henson, “Dark Crystal” and the Kwik Way, SFGate, (Jun 28, 2007). Interview with Jim Henson in 1982 about the film The Dark Crystal — Rosenthal, David N. (December 29, 1982). "Don't Look for the Muppets in 'Dark Crystal'". Lakeland Ledger. Knight News Service (Lakeland, Florida). It's an adventure story. But it's definitely not in our world. I've always thought that science fiction films set in our world have always rung false. I wanted to do a film where the creatures didn't look like us. It's a rather dark vision, actually. People shouldn't come expecting to see the Muppets because they are not here. This is something else.